Euphausiacea sunt minima crustacea, permulta marina quasi caridea animalia invertebrata, gravissimae zooplanktonis? corporis compages, praecipue victus mysticetorum, mantarum, rhincodontidarum, Lobodontium carcinophagorum, aliorum pinnipediorum, et nonnullarum specierum avium marinorum, qui paene solum eis vescuntur. Krill, eorum nomen in multis linguis, est vox Norvegica quae 'examen (piscis)' significat, etiam aliis piscium speciebus tributa. Euphausiacea omnes orbis terrarum oceanos habitant. In Oceano Meridionali, una species, Euphausia superba, biomassam plus quam 500 milliona? tonnarum componit, circiter bis tantum biomassam hominum. Piscatus Euphausiaceorum commercii in Oceano Australi et in aquis circum Iaponiam efficitur. Ordo Euphausiacea diffinditur in duo familias. Bentheuphausiidis est solum una species, Bentheuphausia amblyops, animal bathypelagicum, quod aquas profundas sub 1000 m (3300 pedum) habitat; veterrimum omnium euphausiaceorum viventium habetur. Alia familia, Euphausiidae, continet decem genera, in summa octoginta quinque species, quarum genus Euphausia est maximum, triginta unam species habens. Inclutissimae sunt Euphausia pacifica, Euphausia superba, et Meganyctiphanes norvegica. ↑ "Krill," Encarta Reference Library Premium 2005. ↑ E. Brinton, "The Distribution of Pacific Euphausiids," Bulletin of Scripps Institute of Oceanography 8(2):51–270, 1962, http://repositories.cdlib.org/sio/bulletin/8no2. Boden, Brian P., Martin W. Johnson, et Edward Brinton. 1955. "Euphausiacea (Crustacea) of the North Pacific." Bulletin of the Scripps Institution of Oceanography 6(8). Brinton, Edward. 1975. "Euphausiids of Southeast Asian waters." Naga Report 4(5). La Jolla: University of California, Scripps Institution of Oceanography. Conway, D. V. P., R. G. White, J. Hugues-Dit-Ciles, C. P. Galienne, D. B. Robins. 2003. "Guide to the Coastal and Surface Zooplankton of the South-Western Indian Ocean." Order Euphausiacea, Occasional Publication of the Marine Biological Association of the United Kingdom 15, Plymouth, UK. Everson, I., ed. 2000. 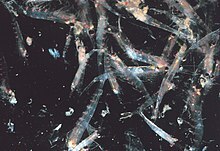 Krill: Biology, Ecology and Fisheries. Oxford, Blackwell Science. ISBN 0-632-05565-0. Mauchline, J. 1971. "Euphausiacea: Adults." Conseil International pour l'Exploration de la Mer. Fasciculus PDF, 2 Mb. Mauchline, J. 1971. "Euphausiacea: Larvae." Conseil International pour l'Exploration de la Mer. Fasciculus PDF, 3 Mb. Tett, P. 2005. "The Biology of Euphausiids." Notae ex 2003 cursu in biologia marina, Napier University. Tett, P. 2005. Bioluminescence. Notae ex editione 1999/2000 eiusdem cursus. Vicimedia Communia plura habent quae ad Euphausiacea spectant. Novissima mutatio die 29 Martii 2017 hora 08:08 facta.